We have discovered that many of the hosts advertising work exchanges have livestock which need tending. We don’t have livestock. Our only current animal experience is a fox which shits in our garden on a daily basis. In our continued (but meagre) efforts to improve our attractiveness to potential hosts we have made a commitment to spend time learning about beasts. 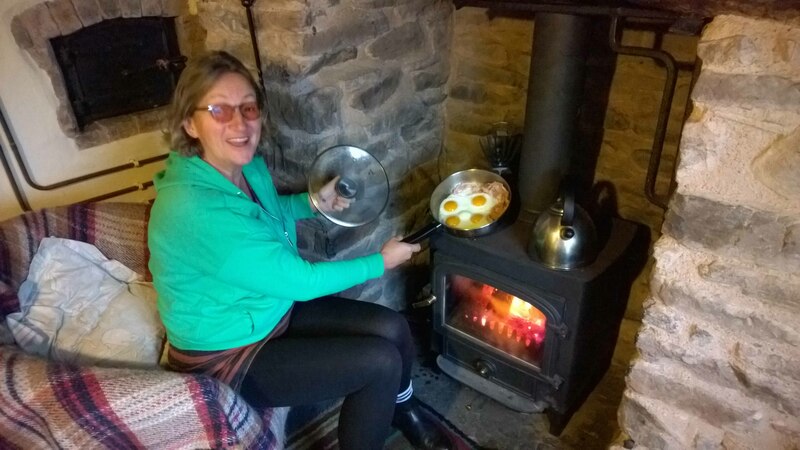 Sarah had a goat tending course booked… but due to unexpected holidaying commitments (tough life) needed to cancel in order to join Keith in France, where Keith was failing to take the opportunity to try-out his newly acquired dry stone walling skills. The scorching, French October weather, spectacular Cevennes countryside, châteaux and occasional café were so inviting that cycling won over hard labour. No dry stone walling practice took place. The boars are winning in their wall demolition objective. However, we are not complete failures. 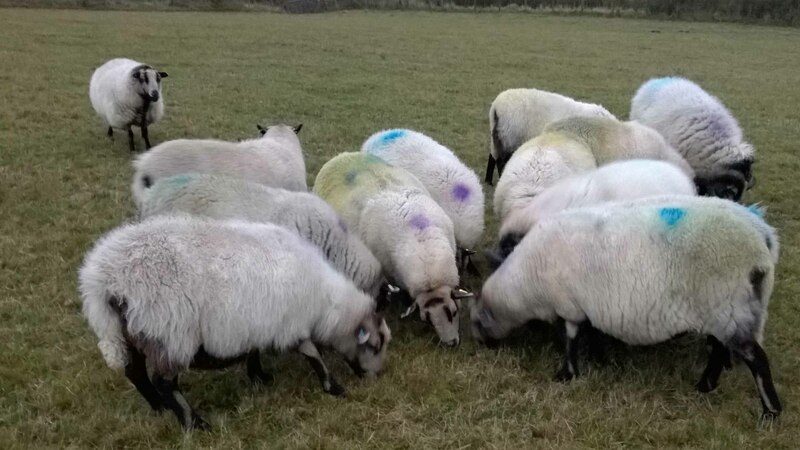 We found a sheep tending course in Shropshire, managed to not get diverted with something more interesting or apparently important, and went off to tussle with sheep. It has to be said we were both completely bowled over with the beauty of this previously unvisited county. OK it was a damp, chilly day, but this did not detract from the rolling green beauty of the surrounding hills, only interrupted by the occasional baa and moo. 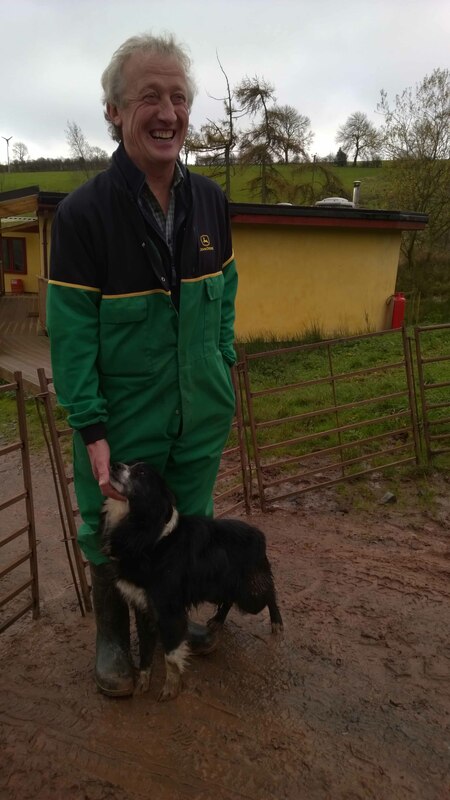 Trevor Wheeler runs Clun Valley Organics on Brynmawr Farm, a 400 strong organic sheep and beef farm on 90 acres of mist shrouded hillside. He also has a beautiful eco cottage on the grounds rented-out to the townies to make them feel they have an authentic country experience in their unused wellies. It was certainly that, although despite the house being toasty in the evenings, no amount of sustainable wood can sustain the voracious appetite of a wood burning stove so as it remains pumping out heat all night – breath on the air and reluctance to leave the confines of a warm bed are almost guaranteed on winter mornings. Take your woolly knickers if you’re going in November. The cottage has spring water, wind turbine electricity and solar heated water plus the wood burning stove. The night sky above is devoid of light pollution and abundant in stars. It’s a stunning location with a warm and jovial host in Trevor, who has lived here all his life and has the calm air of a man largely satisfied with his lot. 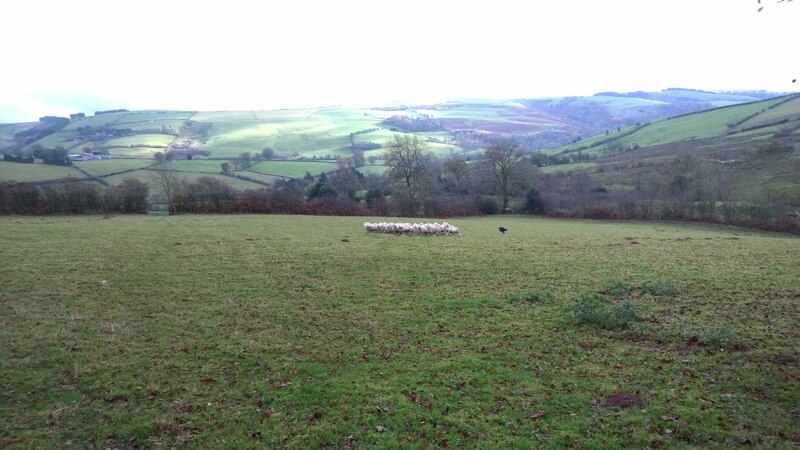 We began our day with finding and gathering some poor sheep to suffer our novice attempts at animal care. 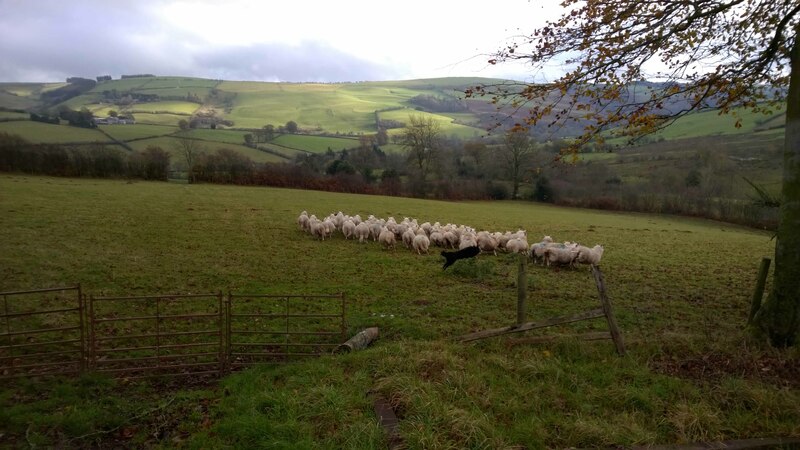 Aided by working dog, Jess, a motley crew of various breeds of sheep were expertly herded. Her innate desire to gather sheep meant that she did so even when told not to by Trevor. A worried bunch of sheep who can spot a couple of amateurs a mile off. 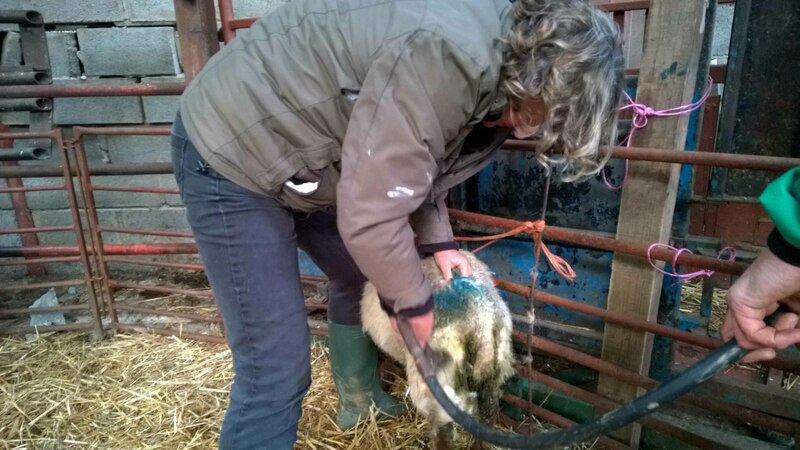 We learned everything there is to know about keeping sheep, including how to clip their toenails, find out how old they are by looking at their teeth and dagging – a ‘dag’ is a cluster of pooey wool on a sheep’s bum. ‘Dagging’ is the removal of said poo with some pretty powerful electric clippers. I was terrified of accidental castration (we learned how to do that too but didn’t get to apply this knowledge). Keith wouldn’t stay still long enough. An ungrateful sheep gets a short, back and sides around the backside. Not sure who was most nervous. I have a new respect for these largely silent, passive creatures, although having seen them follow each each other to get stuck in a hedge, they do deserve their reputation for limited intellectual capacity. 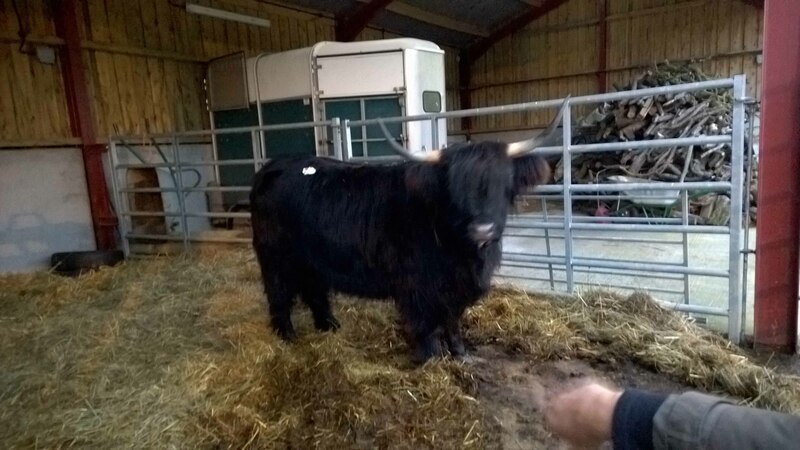 After our day of sheep wrestling, we went off to a neighbouring farm owned by Jacky and James where we met the beautiful Sara, their new Highland cow who was due to meet her new buds out in the field. They were all fantastic and its incredible how fast they move and how much they wave those horns about without ever causing even a scratch to each other. Their spatial awareness is far superior to ours; they don’t appear to have any bruises from bumping into bedframes in the middle of the night when going for a wee. 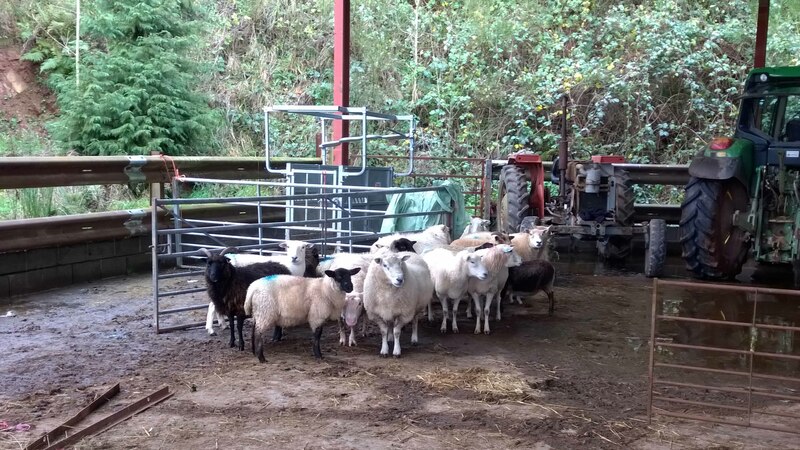 Our final job of the day was to catch 16 Badger sheep – so called because of their black striped faces – and bring them into the barn. No dog this time, just a quartet of middle aged, wheezing individuals running up and down a hill whilst 16 sheep did as they pleased. Eventually, perhaps having pity for the humans, they agreed to head inside. Some of these particular sheep were destined for the abbatoir and half of one of them is currently in our freezer. We had a great day being outdoors and really appreciating being in our own country, as opposed to always trying to head off elsewhere. It really was a revelation to discover this region. We did genuinely think about moving up to Shropshire and as part of our standard location finding exploration, looked at the climate data. 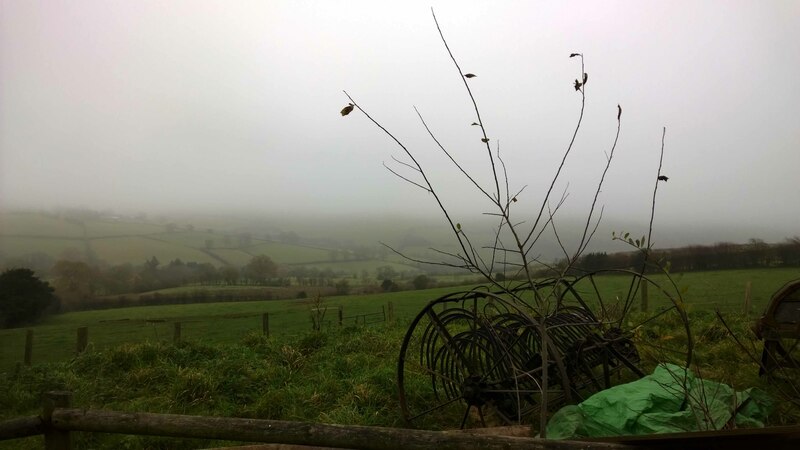 It rains on 233 days each year in Shropshire. That’s why its so green and so beautiful. That’s why its not for us. What was that sound? It was a flock of sheep breathing a sigh of relief. 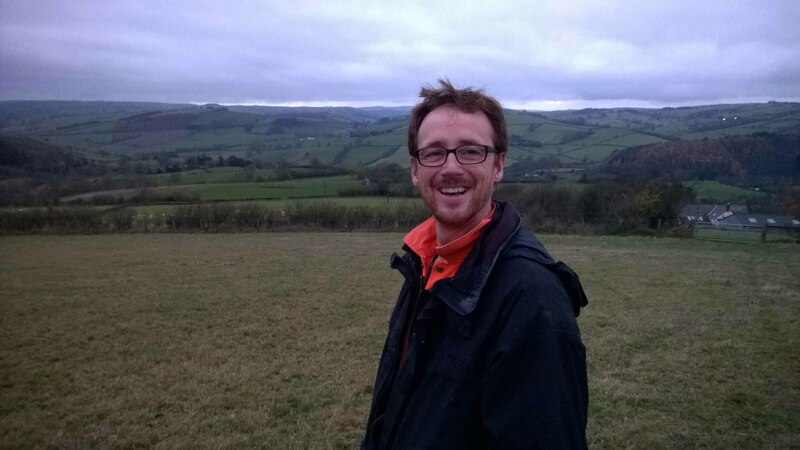 This entry was posted in Permaculture, Travel and tagged Clun, Clun Valley Organics, sheep, Shropshire. Bookmark the permalink.